Relax and rejuvenate after your workout with a healthy fresh snack in the 2020 Centre. Café Refresh is a tranquil place to eat, relax, and catch your breath after an exhilarating day in our fitness center. After enjoying a peaceful yoga class or fitness class in the pool, recharge with a fruit smoothie or brewed ice tea. Research shows drinking a cup of coffee before you work out can boost your performance. Before you start lifting weights or attend one of our group fitness classes, grab a cup of coffee from the café to help power through the workout. Fuel up on fresh hand-crafted salads or design your own signature wrap, all made to order. One of the most popular items at the café is the Cobb salad. Romaine lettuce topped with fresh avocado, bacon, egg, tomato, blue cheese, and ranch dressing makes this a café favorite. Try our Asian salad bowl with kale mix, edamame, almonds, and mandarin oranges with ginger sesame dressing. Our chefs create each salad and wrap with health, fitness, and wellness in mind. In addition to the salads and wraps, the café offers two signature soups on a daily basis. You can stay and eat at the café or grab something to go for a post-workout satisfaction. Enjoy a relaxing day at the spa and salon and treat yourself to a healthy snack. 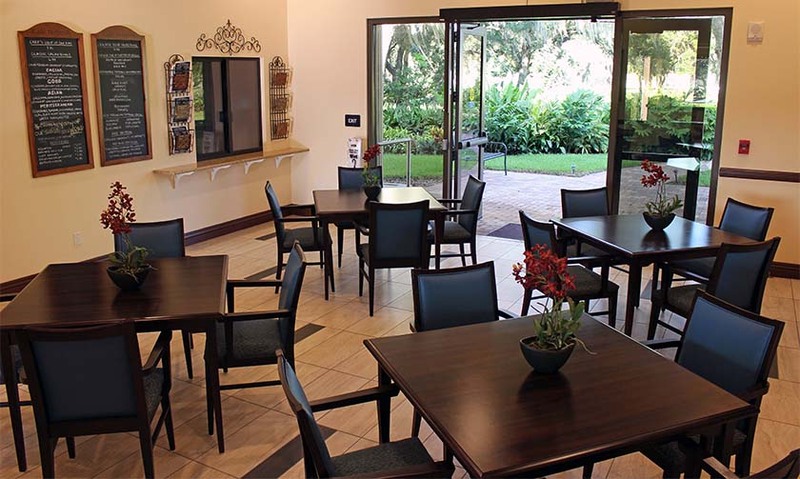 Hang out with friends after a group fitness class and grab a bite to eat from the various healthy options available at the café to keep up with the active adult community lifestyle. Café Refresh is open Monday-Friday from 11:00 a.m.-3:00 p.m.